This commemoration is organised by representatives of the Russian community in Manchester – the Anglo Russian and Eastern European Society. This was a great success with over 100 participants! Totalny Diktant is an annual educational event: a text, written specifically for this event by a famous contemporary Russian writer, is read out to the participants. In Manchester the reader this year was the journalist Masha Slonim. The goal of this event is to demonstrate the importance of literacy, and to unite everyone who wants to write and speak in Russian. The first Totalny Diktant took place in 2004 and the event is organised by the Department of Humanities of Novosibirsk University, Siberia. Participation is free and marked papers are returned to participants with appropriate comments. Total Dictation takes place simultaneously in cities and countries around the globe, adjusted for time zones. A Georgian-Estonian film set during the Abkhaz-Georgian war of 1992-93. 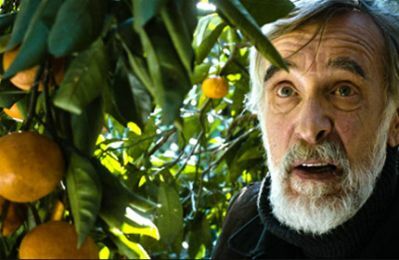 An Estonian farmer who stays back in a war-torn separatist region to harvest his tangerine crop finds and shelters two wounded soldiers from opposed sides. Released to critical acclaim and nominated for best foreign language film at the Golden Globes and Academy Awards, this film is a passionate plea for peace and reconciliation. Russian, with English subtitles . On Sunday January 27th,12:30 pm – there will be a commemoration meeting for the end of the Siege of Leningrad during the Second World War. 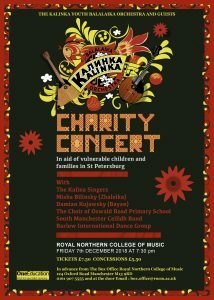 This will be held in the Russian Orthodox Church (64 Clarence Road, Longsight, M13 0YE) after the church service. All are welcome for a simple shared lunch to recall the sad (and joyful) events of that time. Come and bring a contribution of simple food, no frills or delicacies. This is organised by members of the Russian community at the Church. Please share – not to be missed! 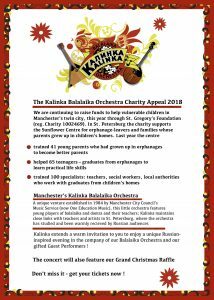 Manchester’s Kalinka Balalaika Orchestra are continuing to raise funds to help vulnerable children in Manchester’s twin city, this year through St. Gregory’s Foundation (reg. Chаrity № 1002469).